To continue, by popular demand, the defensive activities of our Committee, we inform you all that a further possible remedy against Philips’ groundless claims has been traced, considering the latest decisions of the Federal Court in Munich involving the invalidation of important patents. 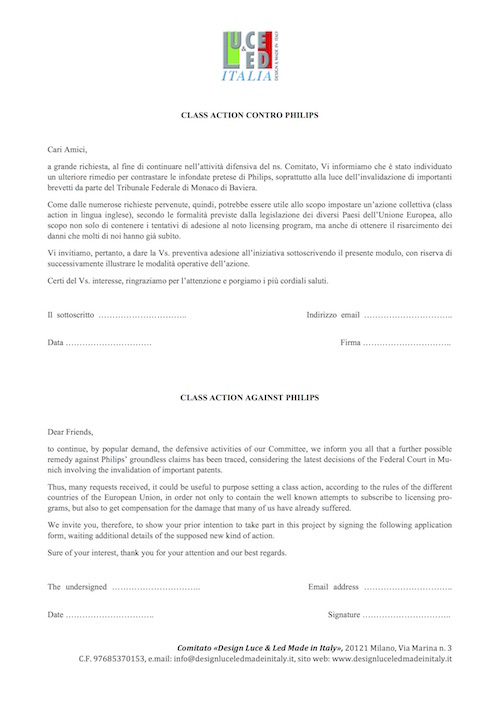 Thus, many requests received, it could be useful to purpose setting a class action, according to the rules of the different countries of the European Union, in order not only to contain the well known attempts to subscribe to licensing programs, but also to get compensation for the damage that many of us have already suffered. We invite you, therefore, to show your prior intention to take part in this project by signing the following application form, waiting additional details of the supposed new kind of action. Sure of your interest, thank you for your attention and our best regards.